Shrink Wrapping - Time To Upgrade? Get Packed supply a range of Pallet Wrappers, pallet wrapping equipment and pallet wrap/pallet protection products that utilise the latest technology whilst producing the greatest yield from your Stretch Wrap enabling cost effective pallet wrapping solutions. Our range of Pallet Wrappers include manual, semi automatic as well as fully automatic pallet wrapping machines with features such as soft start turntables, photo electric eye height sensors, variable top and bottom wraps, variable film tension control and pre-programmable film wrapping cycles. 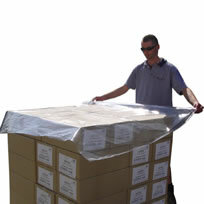 Get Packed also supply a wide range of machine pallet wrap and hand pallet wrap in pre-stretched, cast or blown film which is available in clear or black. 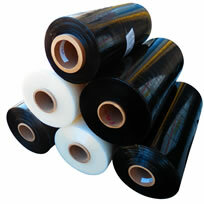 We also supply the latest in ventilated stretch film as well as pallet bands and pallet bags. 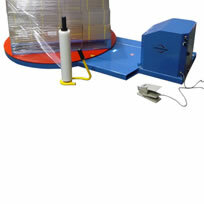 See below for our extensive range of pallet wrappers and pallet wrapping films and pallet protection equipment. The GoodPack R-Wrapper Pallet Wrapping Trolley is an Australian Made pallet wrapping device which is an excellent alternative for those with back issues. The Trolley is a manual and cost effective way of taking your pallet wrapper to your pallet which saves the operator from bending low or reaching high while wrapping pallets with almost no effort. 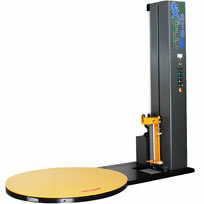 The GoodPack R-Wrapper is available in 5 models which suit pallet heights from 1650mm through to 3000m. All models include a low wrap roll brake. Please see the attached PDF for more detailed information. The Spinny range of stretch wrappers have been manufactured in Italy to the stringent European standards. 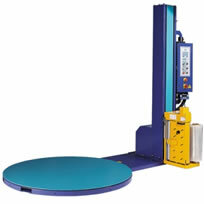 The standard pallet wrapper comes with a 1500mm diameter turntable with a load capacity of 1200Kgs. It has a wrapping height of 2100mm and uses a photocell eye to determine pallet height. 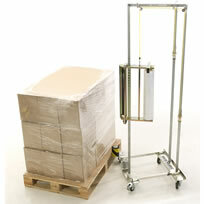 The Q300 Pallet Wrapper is ideal for those who wish to wrap between 15 – 50 pallets per day. The pallet is loaded onto the conveyor from the forklift – the stretch wrap is manually attached to the pallet and the cycle started. Features include – load accumulator conveyor, turntable speed of 1 -12 rpm, a fully balanced and supported turntable of 1651mm diameter as well as a power-roller stretch system at 200% and a variable speed wrapping force. The efficient and productive Q300XT Pallet Wrapper is ideal for those who wish to wrap between 30 – 100 loads per day – without the forklift driver even leaving his seat. It features a remote start lanyard switch which enables the operator to load the pallet onto the turntable, pull the switch and the pallet is automatically stretch wrapped and cut - then take the pallet off. 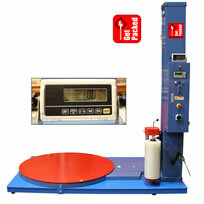 Other features include: load accumulator conveyor, turntable speed of 1 -12 rpm, a fully protected and automatic stretch film cut and clamp, a fully balanced and supported turntable of 1651mm diameter as well as a variable speed wrapping force and a power-roller stretch system at 200%. 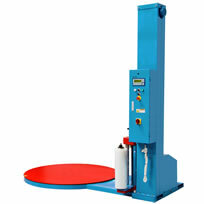 With optional remote control units and various customised options available. The GoodPack Robotic Pallet Wapper is also battery powered and will wrap pallets with a minimum 600mm diameter and max 1.2m high. It is an ideal solution where space is an issue as it hasn't got a turntable. The wrapper will automatically move around the pallet, maximising the yield of the pallet wrap with its built in pre-stretch unit, whilst detecting the height of the pallet and so wraps it with the desired pallet wrap that has been set. It has a rechargeable battery whose life provides approximately 40 pallets. 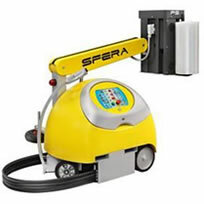 The Sfera Robotic pallet wrapping machine uses a rechargeable battery and can drive in a forward and reverse direction, indoors or out and wraps pallets by rotating around the pallet with the pallet wrap being dispensed from a hinged arm that can raise or lower. 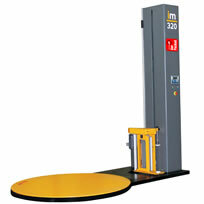 It can wrap pallets of up to 2100mm high with unlimited dimensions. The Sfera pallet wrapper boasts a double roller pre-stretch head that is capable of stretching film by up to 400%, and has been designed for quick and easy threading of the pallet wrap thereby reducing downtime. 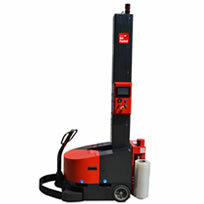 Other features include customized wrapping programs with adjustable Pre-Stretch Control and forklift Slots for easy transport. Like the GoodPack Pallet Wrapping machine the Robbie Robot is also a battery powered automatic pallet wrapper that wraps pallets up to 2200mm high using its telescopic mast. This stretch wrapper has 6 programs to choose from that allows for vertical speed, pallet height as well as rotations up and down (even though it has a photo electric cell). 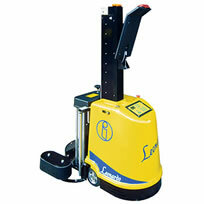 The operator simply presses the start button and the Robbie Robot automatically goes around the pallet. 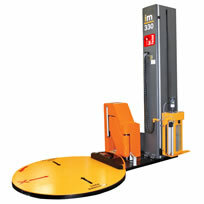 In the case of an obstruction, or if the lateral wheel is not touching the pallet, or even if the film isn't unwinding, the safety system will stop the wrap cycle. The battery powered pallet wrappers are an ideal solution when space is the issue as it only requires a 1.25m working perimeter around each side of the pallet. The Electric Turntable can be used together with hand pallet wrap to wrap pallets - saving on the need to walk around the pallet. 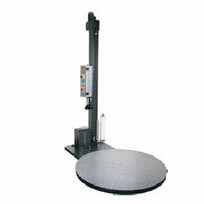 It has a diameter of 1520mm and rotates at variable speeds using a foot pedal -making it similar to a pallet wrapper, but without the mast and film carriage. 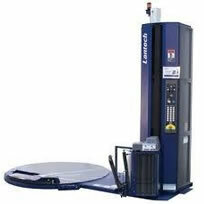 It can hold a maximum capacity of 1500Kg and uses a standard 10amp, 240v power. The ramp is included. The Pallet Lift Elevator provides the lift pallets need to provide for easy stacking, packing and wrapping of pallets without the need for bending and twisting saving on back strain and associated OH&S issues. With no power required and having the option of being able to be relocated using a hand pallet truck, this unit can be used anywhere. 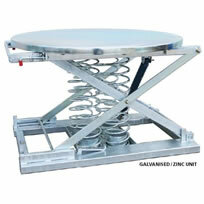 It is a fast and simple operation to remove or insert springs according to your load requirements. 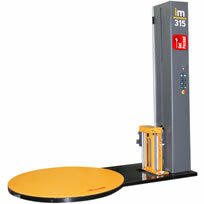 The Pallet Lift keeps the pallet working area at the required height and rotates the pallet to avoid stretching. These Australian made Pallet Elevators have a capacity of up to 1200kg and are finished off in Galvanised / Zinc finish or can be painted Yellow / blue if required. 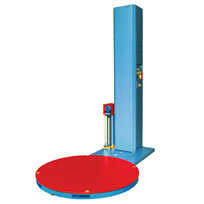 The Rotating Pallet Lift has a Turntable 1100mm diameter, with an extended height of 750mm and compressed height of 240mm off the ground. 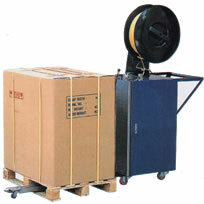 The Pallet Strapping Machine (GPSAS26) is a simple alternative to a pallet wrapping machine. Instead of wrapping pallet wrap around your pallet to secure it, the pallet strapping machine will secure the pallet with polypropylene strapping. It is simply rolled up against the pallet with the horizontal bayonette slipped underneath where the strapping is fed through and under the pallet, and then manually fed back into the strapping machine. This automatically hits a trigger which pulls the strap back in reverse, tensions, heats and seals and then cuts the strapping. View the videos below. A Strap Feeder is used for feeding strap under pallets. It is 1350mm long. 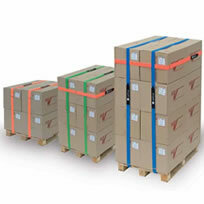 Hand Pallet Wrap or Stretch Wrap is the ideal method to secure and protect your pallet loads during transport. Stretch Wrap Hand rolls save the expense of having to buy expensive machinery to wrap a small number of pallets and are available in a number of styles including Pre-Stretched (S-wrap), Excell Air Ventilated Stretch wrap (ideal for pallets requiring fumigation) as well as Value Plus (a new brand to Get Packed) and are available in various thickness 15um,17um 20um,23um, 25um& 35um. 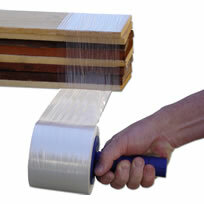 Pre-stretched film (S-wrap) is lighter and goes further than traditional pallet wrap. 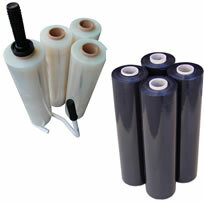 Machine pallet wrap is available in three styles of film to suit different applications and machines. Machine wrap in Blown film is ideal for wrapping heavy and irregular shaped loads with the best puncture resistance available. Cast Machine wrap with ultra high clarity has a lower noise when unwinding from the roll onto the pallet. Pre-Stretched pallet wrap is the newest form of Stretch film or Pallet wrap with lighter and longer rolls than conventional film and with exceptional strength in relation to tear and puncture resistance. Pallet stretch wrap is available in small rolls to tie together, secure and or bundle irregular shaped items, such as timber or plastic pipes. Also seen to be used to easily wrap ice packs onto injuries in sports. Pallet bags (also known as pallet shrink bags) are ideal for securing heavy pallets, which can be shrink wrapped and protected from the elements in a matter of minutes by using a heat gun (also sold by Get Packed). Pallet bags are available in ready made bags (on a roll), or continuous tube form in a wide range of thicknesses. 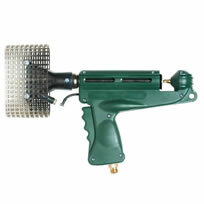 To purchase the Gas Gun required it is also listed in the shopping cart link below. 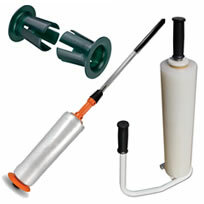 Using a powerful source of instant heat through gas the heat shrink gas guns are used to shrink protective film or pallet bags over pallets, as well as other uses such as melting road markings, heat sealing roofs, roof tar felting and sealing ventilation tubing for clean room use. With no electrical connection required the gas bottle operation offers unrestricted mobility. Safety features of the gas gun include an automatic valve on the regulator oritecting the user from hot nozzles and air, a double safety regulator protects the appliance from internal overheating which allows for a long reliable and productive tool life. 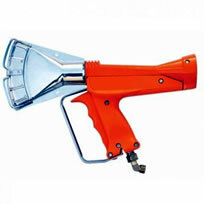 The lightweight GoodPack G-32 Gas Gun is powerful and easy to operate. It is used for the heating and shrinking of pallet bags around a pallet as well as shrinking protective polythene sheeting or protective white shrink film to wrap boats or machinery. Pallet Bags (as seen above) are used to create supreme load stability and weather protection for items either stored outside or open to the elements during transport.The GoodPack Gas Gun uses a Piezo crystal iginition system, LPG, with the nozzle protected by an integral heat shield. Comes complete with n 8m length of hose. LogiStrap is unique in that it is a 5m strip of velcro with a 50mm diameter that has a metal loop that allows the user to pull the strap tight, through the loop, and secure back onto itself. 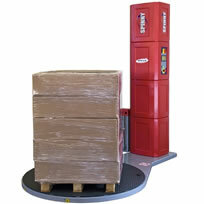 This makes it particularly easy to use to secure your pallet of stock or loads. 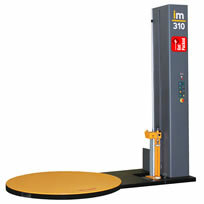 It is re-usable and it commonly used in material handling applications in warehouses and closed loop logistics. Ideal for transport and storage of product. 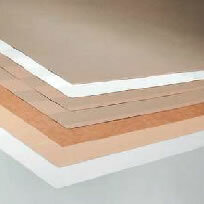 Top sheets or dust covers are used as protective covers from the dirt, dust or the weather on top or bottom of pallets. Top Sheets come on a perforated roll for easy tear off application and are available in clear or black. Grip Sheets are a protective non-slip paper insert used to place between boxes or products on pallets to reduce slippage and therefore breakage. They are able to do this by creating friction between the layers on a pallet. Grip Sheets can be used in conjunction with usual forms of pallet stabilising products like strapping, tape or pallet stretch film, and may even enhance their efficiency. They are available in two grades in 90gsm or 160gsm by 1100mm x 1100mm in either a recycled Kraft or a waterproof version and some are suitable for direct contact with food products. 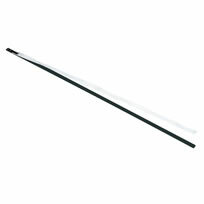 They are offered in varying weights to best fit your application. 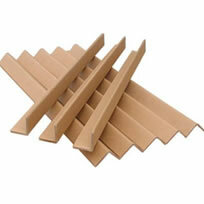 Due to their water repellent properties they can also help in the protection of pallets from moisture. Grip Sheets can be used on all types of loads – for example, plastic sacks, cardboard cartons, sheet products like glass or paper and it has the advantage of keeping the pallet intact without marking or tearing and can be put into position manually or by an automatic palletizing system. Protective corners can be used with strap or pallet wrap to secure and help stabilise a pallet while protecting the corners or edge of the pallet.